We invite you to embark on a surf adventure expanding past the ocean and into the desert horizon, encompassing all areas of Moroccan delight: arid treks, mountain excursions and the best of market wanderings. We will be guided to all the unmissable sites of Marrakech and its valleys, glamping under the stars in the desert, exploring the Atlas Mountains, the city of Essaouira, and the quaint surfing village of Immsouaine with a perfect peeling right. We will immerse ourselves in the vibrant and colorful culture of the country and dive into the exotic cuisine of local tagine, couscous with harvest vegetables, sweet chebakia, and many more. In appreciation of the destination, we will also give back to the community by collaborating with Project 91 and take part in their Leave Your Wardrobe in Morocco campaign. Surfer + Travel Writer Lex Weinstein will also lead a workshop in journal writing to cultivate a deep, intuitive experience so as to document every moment of this journey of a lifetime. Spots are almost sold out, make sure to get yours here, and enter code HEREWITH30 to get 30% off your entire trip! This is a charming surf camp by the sea in Imsouane; the village is known worldwide for being located on one of the most beautiful bays in Africa, The Magic Bay. We will be staying in a surfhouse for easy access to the ocean. The area offers perfect cool, surf weather year-round. The ideal setting that allows you to enjoy moments of peace and relaxation while watching the magnificent sunsets of Morocco. Our days will continue near the water with a guided tour through the enclosed city of Essaouira, formerly known as Mogadar. The focus for our last few days will be to enjoy the waves and sea life of Morocco. 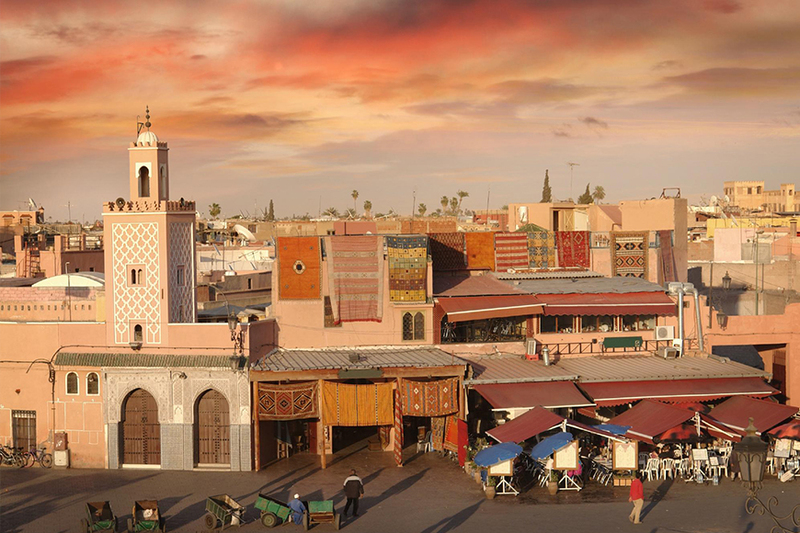 See the unmissable sites of Marrakech on a half day private tour. It is a major economic center characterized by labyrinthine streets, famous markets, apothecary shops, and leather making shops (tanneries). You’ll enjoy the city’s historical gardens, monuments, and experience the exotic atmosphere of the medinas and souks (marketplaces). Experience Marrakech from a horse-drawn carriage, pass by the 12th-century ramparts that protect the Marrakech Medina, see the city gates ("babs" in Arabic) and hear about their stories. We’ll visit the famous art piece, Majorelle Garden Maid by the French painter Jacques Majorelle, which was restored by the fashion designer Yves Saint Laurent and even walk through the Jewish Quarter and Medersa Ben Youssef, a Quranic school, to discover the distinct yet beautiful styles of Arabian-Andalucían architecture. Of course, we cannot miss a visit to the Koutoubia Mosque, the very symbol of Marrakech city. We will end the day on a culture immersed note with a trip to Jamaa El-fna square, famous for its shops, musicians, storytellers, and snake charmers. Imagine a charming open camp of a dozen glamping tents in the beautiful deserts of Morocco. No distractions,no noise; just your thoughts and frequent conversation with other camp goers. While day time fosters a warm day under the sun, night time projects a night under the imaginable number of stars. Set against an elegant and simple backdrop, natural materials such as African woven matting, Berber rugs and Moroccan lanterns, give the impression of being on an expedition from the past. The excursion will begin with a drive to the Atlas Mountains, in the company of an experienced guide. Here, we will pass through traditional Berber villages and discover the authentic life of Berber people, meeting locals, visiting Berber homes, and sampling their traditional mint tea and homemade bread. We’ll continue onto the Kik Plateau to enjoy its inspiring views and then have a traditional Berber tagine lunch with Moroccan salads and bread at the lake. After the meal, we will take time to relax before our exciting dune bashing experience across the Agafay desert!